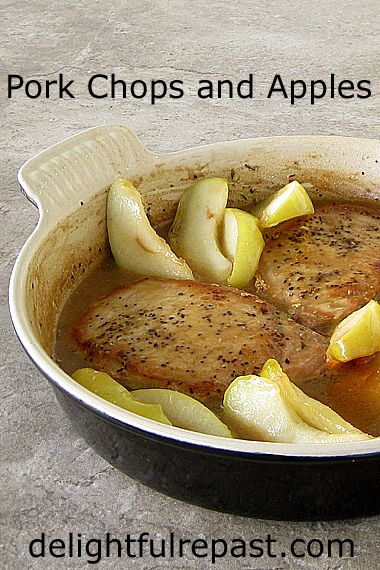 Pork Chops and Apples is a well-remembered dish from my childhood, but I make it differently. My mother browned the pork chops and made the sauce/gravy on the stove, then transferred everything to a big yellow oven-proof bowl that easily held 12 pork chops and lots of apples. Now I have the bowl, a vintage 1960s Pyrex 4-quart nesting mixing bowl. Though I rarely use it—somehow it seems more precious than other more delicate and valuable items that were my mother’s—I enjoy getting a glimpse of it now and then in the deep, high cupboard over the refrigerator. Separated in age from my three (all older) siblings by a 6-, 9- and 10-year gap and having parents with their own stresses and strains, my early and middle childhood days were often quite chaotic. But whatever else went down on any given day, it all stopped for dinner. Food was what brought the family together. The cooking of older food writers she liked, such as Patience Gray, Elizabeth David and Julia Child, was inspired by their travels. But my mother never felt the need to travel. Her food took her anywhere she wanted to go. From the best of British and American cooking to the most complicated Chinese dishes, she was an inspired cook. So here it is: my stovetop Pork Chops and Apples. I had to make it up as I went along because my mother stopped making it once there were no longer six (and often more) at the dinner table, which was before I started writing things down as she cooked. They don’t taste like her pork chops, but they taste good! 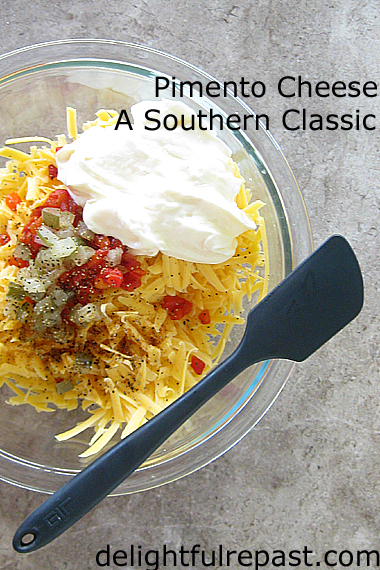 This takes about 45 minutes from start to finish and can be made ahead (details in the directions below) for busy nights. Great with Perfect Mashed Potatoes and a vegetable or two. 1 Don’t peel the apples. Quarter them and with a paring knife, cut out the core from each quarter. Slice each quarter into 3 slices. 2 In 12-inch skillet over medium heat, melt the butter and sugar; stir in the apples. They should be sizzling. Cook, stirring occasionally, for 5 minutes until caramelizing a little. 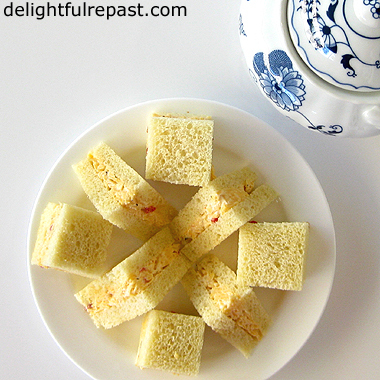 With slotted spoon, transfer apples to a plate. 3 Add the teaspoon of oil to the pan and swirl it around. Place the chops in the hot pan, sprinkle with 1/8 teaspoon of the salt and 1/4 teaspoon of the pepper. Over medium to medium-high heat, cook for about 5 or 6 minutes until well browned. Turn, season with 1/8 teaspoon salt and 1/4 teaspoon pepper. Cook for about 5 or 6 minutes until well browned. Transfer to a plate. 4 Add the butter to the skillet. Whisk in the flour and cook for 1 minute. Whisk in brandy, then balsamic vinegar and Dijon mustard, scraping up all the brown bits in the pan. Then whisk in broth, marjoram and thyme. Simmer and stir until thickened, about 5 minutes or so. Or longer—as long as it takes for the sauce to be nicely thickened and the flavors concentrated. Note: This dish may be made ahead to this point and the pork chops, apples and sauce all refrigerated separately. Twenty minutes or so before serving, thoroughly heat up the sauce in the skillet. 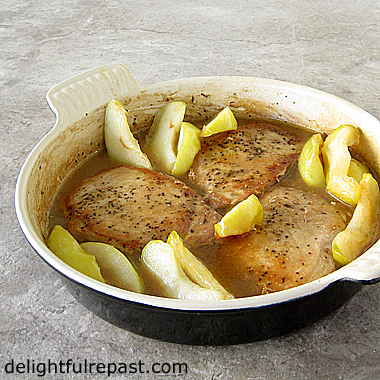 Add the pork chops and apples to the skillet, cover and simmer until heated through. 5 Return chops and apples to pan, along with any liquid that collected on the plates. Sprinkle with 1/8 teaspoon salt and 1/4 teaspoon pepper. Simmer over very low heat, covered loosely, for about 10 minutes to warm them through. Taste and adjust seasoning. Pumpkin Custards are the solution when you’ve got gluten-free, wheat-free, grain-free or refined-starch-free people coming for dinner. As long as they’re not also sugar-free, egg-free or dairy-free, that is. Of course, at this time of year we are bombarded with pumpkin recipes, so many readers will have already moved on. But I’m a year-round pumpkin fan and couldn’t resist putting another one out there. 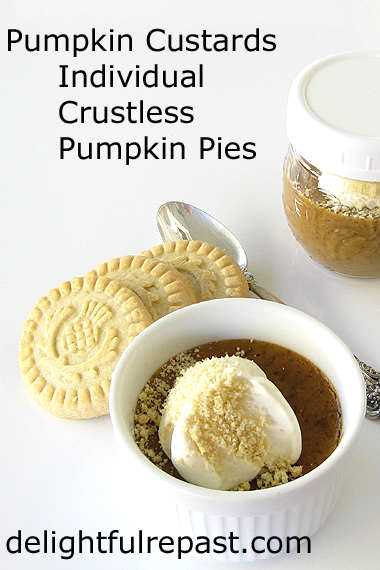 This time I used a couple of little round half-pint jars, too, because that turns an individual pumpkin custard into a totable/toteable (?) lunchbox dessert. 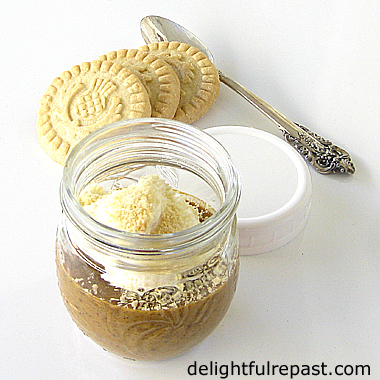 And there’s enough room in the jar for whipped cream! Mr Delightful was missing the pie crust, so I crushed a couple of Walkers Pure Butter Shortbread Rounds to sprinkle on top. Loved it! Baking these in a water bath is really easy and gives the custards such a wonderfully smooth texture. No need to get complicated, putting a tea towel in the bottom of the baking dish or anything; the ramekins won’t rattle around. 1 Preheat oven to 300F/150C/Gas2. Put the kettle on, heating water for the water bath. 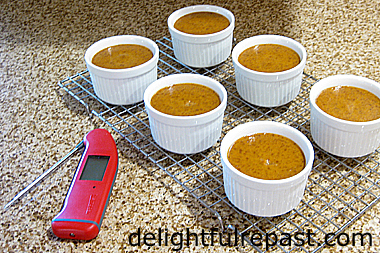 Place six 7-ounce ramekins or custard cups (or half-pint jars) in a 13x9x2-inch baking dish. Note: These are similar but slightly larger white ceramic 8-ounce ramekins. 2 In medium bowl (using a 2-quart glass measure makes it easy to pour the filling into the custard cups), whisk together sugar, cornstarch, salt and spices. Whisk in the eggs, then the pumpkin and then the milk. 3 Pour the filling into the ramekins. Close to the oven, pour the hot water into the baking dish at least halfway up the side of the ramekins and nearly to the level of the custard. Place in oven, being careful not to slosh water into the custards. 4 Bake for about 60 minutes (maybe check at 55 minutes, all depends on your oven) or until it registers 175F/79C on an instant-read thermometer. The custards should still be slightly jiggly and will firm up as they cool. Forget about the old knife coming out clean thing; they would be waaay overbaked. 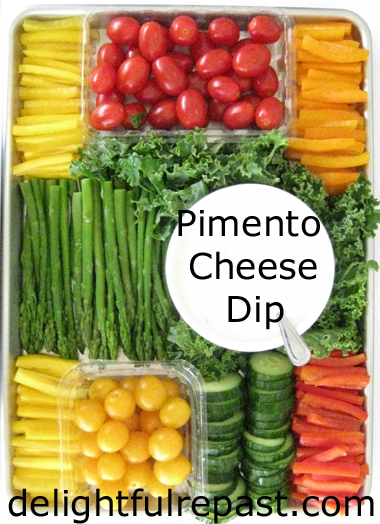 5 Cool completely, about 1 hour, on wire rack, then cover and refrigerate for at least 3 hours or up to 3 or 4 days. 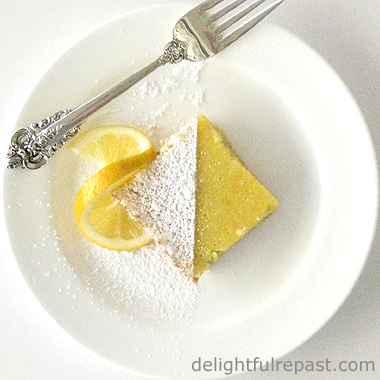 Serve with softly whipped cream. I sweetened and flavored 1/2 cup heavy whipping cream with 1 teaspoon of real maple syrup and 1/2 teaspoon vanilla extract. Note: If you’re making these in the half-pint jars for a picnic or lunchboxes, whip the cream to a stiffer consistency so that it will hold up for a few hours. Top the custards with the cream (and shortbread crumbs, if you like) and put the lids on. Don’t forget to pack spoons! Sheet Pan Beer Brats Dinner came to mind as I was perusing the offerings at my favorite meat shop. I love shopping there because it is pristine and all the meat is local, grass-fed (or pastured), sustainable and produced by farmers who practice good animal stewardship. I had the sheet pan dinner concept in the back of my mind and was looking at the chicken when I spied the brats. 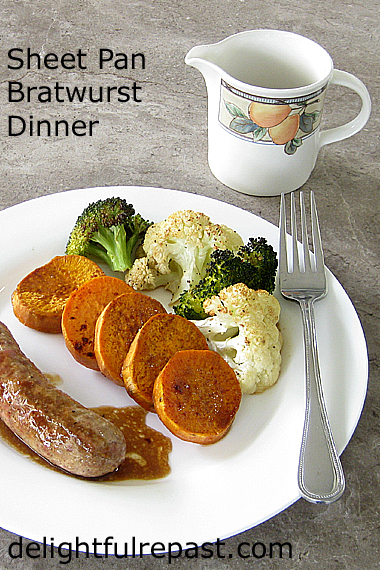 I did not grow up eating bratwurst. I grew up avoiding processed meats, so rarely even had a hot dog. But a couple years ago I walked into this shop when one of the owners was making brats—Wisconsin-style with coarsely ground pork. They make all their own sausages with the best ingredients. So I took home four “homemade,” unprocessed brats and haven’t looked back since. 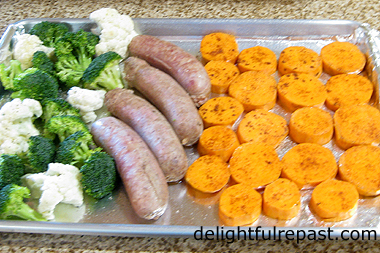 A sheet pan dinner is what I call streamlined cooking. And there are at least a few days a week when dinner really needs to be streamlined. It’s such an easy way to get lots of different vegetables into your diet because they all cook together. Cabbage wedges would’ve been good with this, and I’ll do that next time. I do a lot of wine reductions but have never even heard of a beer reduction. It was just going to go against my grain to pour that beer down the drain, though, so I thought I'd make a little sauce out of it. Love it! For more streamlined cooking, Sheet Pan Chicken Dinner. 1 Pierce the sausages six times each with a toothpick or a few times with a knife. Put them in a wide saucepan with the beer. Bring to a boil, reduce heat and simmer for 15 minutes. 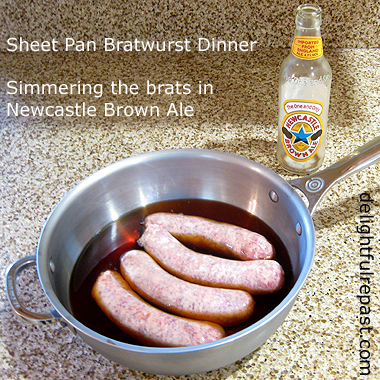 Leave the brats in the beer until you place them on the baking sheet. 2 Preheat oven to 400F/205C/Gas6. Line an 18x13x1-inch half sheet pan with aluminum foil and spray with cooking spray. In a 1.5- to 2-quart bowl, toss sweet potato slices with 1/2 tablespoon of olive oil. Lay out the slices at one end of the baking sheet. Sprinkle them evenly with the cinnamon-salt mixture. 3 In that same bowl, toss the broccoli and cauliflower florets with 1/2 tablespoon olive oil. Spread them out at the other end of the baking sheet. Put the beer-boiled brats in the center of the baking sheet. 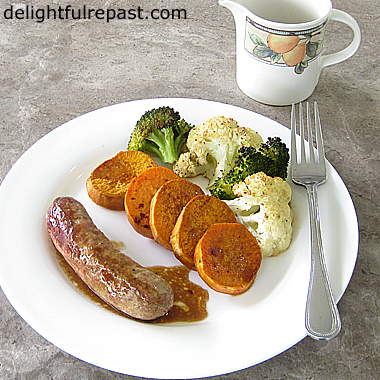 Sprinkle the broccoli, cauliflower and brats with salt and pepper. 4 Bake for 30 minutes. In the meantime, strain the beer into a glass measuring cup and wipe out the saucepan. Pour the beer back into the saucepan. Bring it to a boil, and adjust the heat to keep it at a slow-ish boil until it is reduced to 1/2 cup. Just pour it back into the glass measuring cup from time to time to check it. 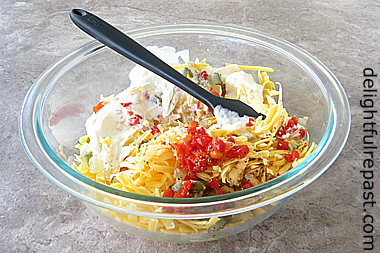 When it’s down to 1/2 cup, whisk in remaining ingredients. 5 Drizzle sauce over all, or let each person sauce his own plate.